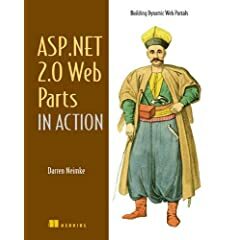 ASP.NET 2.0 brought us all sorts of new technologies and one of the most exciting is Web Parts. Web Parts are versatile contols over which the end user can exhibit some level of control and form the basis of portals. In his recently published book, Darren takes us from the very basics of web parts and portals to advanced techniques of portal building. Darren’s book is well written, and illustrated with screenshots and code (which can be downloaded from the publisher’s website).